The Petronas Twin Towers (88 floors) was considered the world’s tallest building when completed in 1998. And remained so till 2004 when Taipei surpassed it with 101 floors. Now the tallest building of the world is ‘Burj Khalifa‘. The other comparable towers were the Willis Towers and the World Trade Center Twin-Towers with 110 floors. Moreover, quite often tall pinnacles or antennas are erected at the top to increase height rating. It was firstly built for National Petroleum Company of Malaysia. The plan of architecture for each tower is identical: an eight-lobed circular structure. That contains 88 stories of occupiable space and a pyramid-shaped pinnacle surmounted by a slender steel spire. The height of both towers is 1,483 feet (451.9 meters), which includes 242 feet (73.6 meters) for pinnacle and spire. The standard rules differ. However, according to U.S. based CTBUH, such antennas are regarded as superficial structures to confuse height. And do not add to structural use or design. 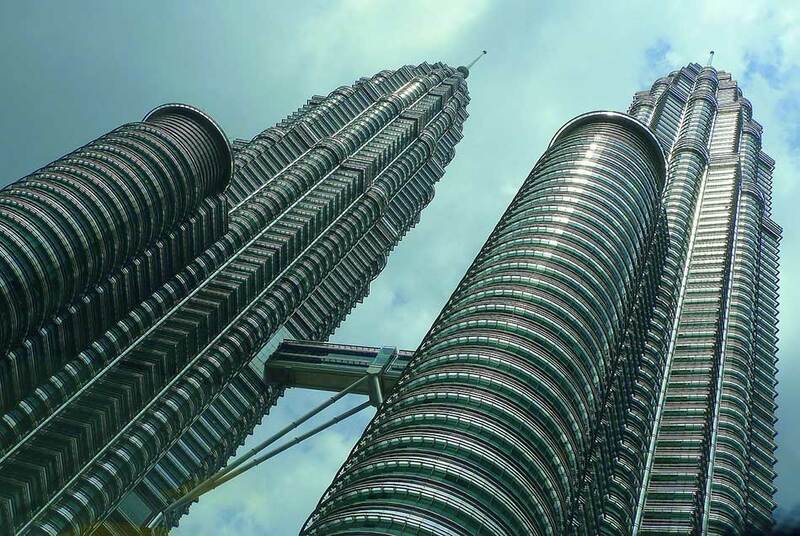 Accordingly, when Willis Towers 250 ft. tall antenna was excluded, the PETRONAS Tower was assessed 10 meters higher. 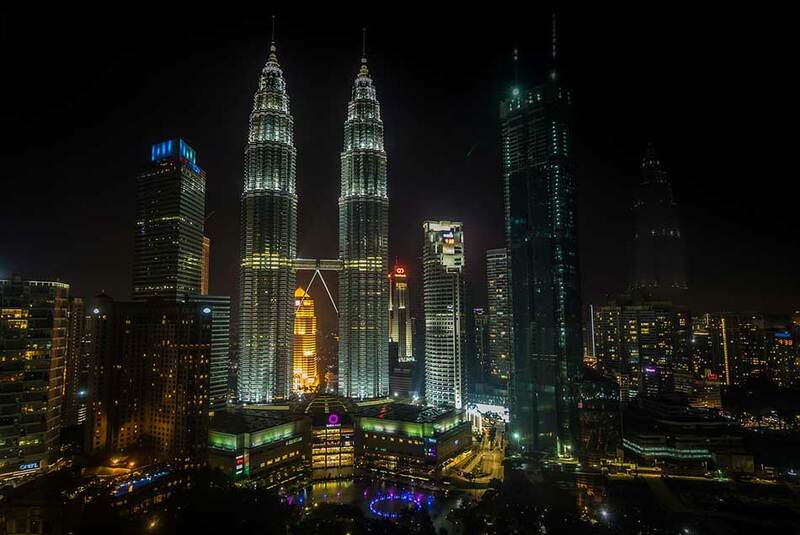 The PETRONAS Twin Towers are designed by architect Cesar Pelli. These Towers have the deepest bedrock or a 120-meter deep concrete foundation. Moreover, the beautiful design reflects Islamic motif art. And its circular structure presents a very picturesque outlook. However, high strength reinforced concrete is used for stability against strong winds. The Tower’s main strength comes from its 23 x 23 meters in concrete core. The supporting columns spread in the outer circle to provide clear office space ranging up to 2000sqm each floor. The floors below ground level, House Suria KLCC. The biggest shopping mall. It also has KLCC Park spread over 66,000 sqm. jogging paths, fountains, pools and children playgrounds are all provided. Furthermore, the Malaysian Philharmonic Orchestra is also there. The Petronas Twin Towers are a popular tourist attraction. These monuments are receiving thousands of visitors almost every day. Visiting the towers is a very organized event. Tourists have excellent views to see such as Skybridge, the Observation Deck, and of course the infamous gift shop. Skybridge is the 41st floor of the building and it is 170 high from the ground. Observation Deck 86th floor, you’ll get the chance to see the Kuala Lumpur with 360 views. The PETRONAS and their subsidiary companies and associates occupy Tower One. The Tower two tenants include well-reputed companies like Al-Jazeera, English Boeing, IBM, Mckinsey & Co., Microsoft, Reuters, Krawler Network and so on. The two-story bridge is built connecting the two towers on 41st and 42nd floors. The world’s highest bridge is 58m long and weighs 750 tons. And visitors are allowed up to the bridge through free passes. The sky bridge is also a safety device for facilitating evacuation in case of an emergency in any tower. The staircases and multiple lift systems are sufficient for total evacuation if needed. And a drill trial was conducted successfully. Otis lifts are installed in the center of each tower. The double Decker lifts service two floors at a time. And this sophisticated system consists of dozens of lifts arranged for “short haul” servicing floors up to 20 and “long haul” servicing up to floors 42, the podium. From here people, as well as change, lifts to reach top floors in a pattern, similar to lower floors. Besides these, “shuttle lifts” operate non-stop from G/1 to floor 42. In case of emergency, this also help vacates people from top floors quickly. First, you need to buy the ticket for getting the chance to visit this incredible monument. The total visit time from the ground floor is Forty-Five minutes. Therefore, there are only 15 minutes to check in after buying tickets. As well as, they usually don’t wait for no one until ‘You’re VIP’. First, they take you to the Skybrigdes which is on the 41st floor. They only give you 10 minutes to stay and you can click photos and take a feel of the incredible view. After that, you’ll go to the 86th floor ‘Observation Deck’. As its name shows, you can take a look at the whole city from there. And it feels superior. 15 minutes to stay are allowed there. As I already told you that the whole city is in front of your eyes with 360 degrees view. Next destination is the ground floor’s shopping mall. As well as, one of the biggest shopping mall in Malaysia.